A mass-market paperback edition of The Silver Chair, book six in the classic fantasy series, The Chronicles of Narnia, featuring cover art by Cliff Nielsen and black-and-white interior artwork by the original illustrator of the series, Pauline Baynes. 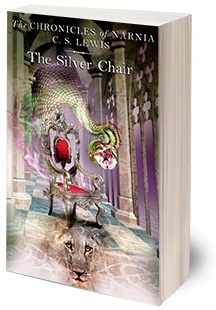 The Silver Chair is the sixth book in C. S. Lewis's classic fantasy series. For over sixty years, it has been drawing readers of all ages into a magical land where giants wreak havoc and enchantment rules. This is a complete stand-alone read, but if you want to discover what happens in the final days of Narnia, read The Last Battle, the seventh and concluding book in The Chronicles of Narnia.